Uniformitarian geologists have observed limestone features in rocks ranging from Precambrian to Neogene, and interpreted them as ancient buried landscapes—paleokarsts. Assumed to require repeated periods of long sub-aerial development, paleokarsts have been used to challenge the 6,000-year biblical time-scale. On closer examination, paleokarst is found to be a vague term adaptable to many uses. Karst landscapes develop today on the surface of limestones and dolomites when soluble rock material is dissolved by CO2-enriched water. Distinctive landforms are produced including large scale pocket valleys, blind valleys, caves and potholes; medium scale dolines*, shafts, and karst springs; and small scale microkarst and karren*. None of the large scale karst features present today are found as paleokarsts, though standard geology claims that much better karstification conditions existed during most of the ancient past. Moreover, even under a thick rock cover, karstification continues unchecked, making it highly unlikely that old karst features could survive unchanged. If such long periods of time had been available, most of the limestone deposits should have been dissolved away a long time ago. It is therefore subjective to ascribe such great ages to what proves to be in most cases a series of superimposed and overwritten features. Paleokarst is therefore a confusing term because the observed features were formed under different conditions from those that operate today. Paleokarst is therefore a confusing term because the observed features were formed under different conditions from those that operate today. There was a major qualitative change in the genesis of landforms, especially karst landforms, at the end of the Tertiary. Indeed, the Quaternary seems to be the only era of true karstification processes. Rather than a problem for Flood geology, the pattern of karstification in the geologic record is easily understood in terms of the different geologic processes that operated during the global Flood and the post-Flood era. We are used to seeing rivers flow on the surface of the earth, sometimes at the bottom of very deep canyons. They often cut chasms of incredible size and with bizarre shapes as they descend continuously towards an illusory rest—the sea. Yet, there are rivers which, as if hiding a shameful secret, choose to flow underground—sometimes over a kilometre below the surface. There they flow inside the earth, lured by the same illusory rest. This is how, in less prosaic language, one may define the essence of limestone terrain. Not all rocks allow water to behave in this way. The rocks must yield to the chemical attack of rainwater enriched in CO2—usually by plants and organic material from the soil. More importantly, these rocks must be able to absorb rainwater. In limestone, water is absorbed into a widely developed three dimensional network of joints (secondary porosity) and primary voids (porosity). No matter how large the volume of rock, it will rapidly fill with water and become a natural subterranean reservoir. In order for the subterranean water to move, there is need for a hydraulic head. At least one site must exist, either below or at the same level as the water table, from where the subterranean water can emerge into the light of day. Once this setting is achieved, the continuous supply of aggressive water penetrating into the rock starts to enlarge the joints and voids, generating genuine subterranean streams and rivers inside caves and cave systems. We can now speak of a mature karst geosystem*. The input areas, where the surface water sinks into the rock, impress the passer-by with their distinctive landforms*: funnel-shaped dolines, all sorts of fluted rock, with intricate channels and runnels—karren or clints and grikes*. 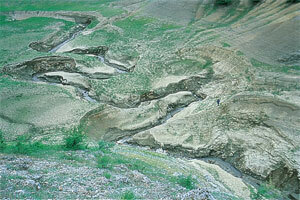 Entire rivers are ingested by a swallowhole* at the foot of a rock step that cuts across the river-bed—a blind valley*. One wonders what would happen to these distinctive karst landforms once they were buried under thick sediments. Uniformitarian geologists have observed limestone features in rocks ranging from the Precambrian to the Neogene, and interpreted them as ancient buried landscapes—paleokarsts*. Would it be possible for buried paleokarsts to survive unchanged? Or would they continue to erode away after they were buried, since water is known to penetrate deep underground, and limestones are shaped by chemical, not physical erosion? Finally, did the same erosional processes that carve karst landscapes today, form the buried ‘paleokarst’ features in the past? After all, pseudokarst* (false karst) is quite frequent today and, once buried, what would be chances of telling the difference between the true and false karst? Anti-creationists use these ‘paleokarst’ features, abundant in the geologic record, to challenge the validity of the biblical Flood. How could karst landscapes, which require long periods of sub-aerial development, have formed repeatedly during a one-year global flood? Paleokarst is a geological phenomenon that requires a creationist investigation. However, we must properly understand what is meant by karst and paleokarst. The word karst first appeared on a map published by Mercator at Amsterdam, in 1585. The famous mapmaker called the area east of Trieste, Italy, ‘Karstia, Carniolia, Histria et Windorum Marchia’.1 The Romans called the same area Carsus. The word seems to come from the pre-Indo-European period, as Karra, meaning stone.2 It was then adopted by the Celts to mean ‘stony desert’ and ended-up in Slovenian as Kras, a regional name for the area mentioned above. 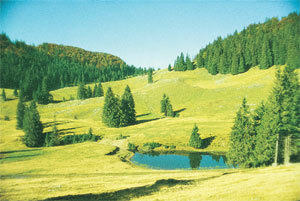 After the territory was included in the Austrian Empire, Kras was germanicized to Karst. The Viennese geologists and geographers of the 19th century were the first to scientifically study the area, and they introduced the scientific terminology, coining both local (Serbian) and German descriptive terms. These included doline (from Serbian), known in the Anglo-Saxon literature as sinkhole or shakehole;uvala* (from Serbian) meaning a series of coalesced dolines; polje* (from Serbian) literally meaning ‘field’ (a very large enclosed depression over 1 km across, with a flat alluvial bottom and one or more streams coming from a karst spring inside the polje and sinking inside the polje); kamenitza (from Serbian) meaning a rock pool; karren (from German) also known as clints and grikes or lapiés in French; ponor (from Serbian) meaning swallowhole, or swallet, (a place where a stream sinks under the ground). Other terms like blind valley (a karst valley abruptly terminating via a swallowhole) and pocket valley (reculée in French, sacktäler in German, the reverse of a blind valley, a valley suddenly beginning at the foot of a cliff with a karst spring) also have regional origins. All this is a peculiar kind of terminology, based on morphology, with Kras remaining a type locality. However, the incredible mixture of terms makes it difficult to communicate in a precise, unambiguous, scientific language. These stages are also present in the vertical classification of karst hydrographic zones.2,8–10 With one exception, unless all four of these stages are present, orthokarst and parakarst features do not occur*. The exception is that several small-scale surface features, such as karren and kamenitzas, may be present as parakarst features on a large variety of rocks, including granites.1,2,8,11 However, these parakarst features are not generated by simple CO2-rich rainwater but by local acidification. On limestone (and rock salt or rock gypsum), all surface input features are connected to more-or-less vertical channels through which water circulates towards the storage section. If there is no output for the stored water, the entire lithostructural unit becomes waterlogged, long before karren, dolines and blind valleys can form. In such cases, there are no distinctive karst landforms. Thus a two-fold distinction emerges. Not all small-scale surface karst and parakarst features can be associated with proper karstification processes. However, whenever medium-to-large scale surface (and subsurface) karst and parakarst features are present, they indicate the existence of all four stages of the karstification process. Consequently, any correct reconstruction of a paleokarst should identify those medium-to-large scale features. In modern times, most of the fundamental treatises of geology have only mentioned karst for its speleothems12—its subterranean crystalline deposits including stalactites and stalagmites. Occasionally, mention is made about ‘paleokarst’ as a paleoclimatic and paleogeographic indicator, but with little more than the concept of karst as a geomorphic feature. Caves however, hold a special place in Quaternary geology and paleontology, because of their sediments and the associated fossils (flora, fauna and humans). However, they have only been considered a special, high-quality natural ‘storage facility’, and not a part of an important geosystem with which they are finely tuned. Only after speleothems were first radiometrically dated in 1958,13 was the potential of the karst geosystem for high resolution dating of the Quaternary recognised. The allegedly isolated environment of caves and the abundance of crystalline formations lured the new breed of ‘radiometrists’. The use of radiocarbon for these first datings drastically reduced the range to the last glacial period. Nevertheless, the ‘snowball’ was rolled over the rim, and it was just a matter of time until new radionuclides were promoted as stars on the newborn radiometric stage. Apart from the obvious confusion of terminology, another problem is that these definitions do not cover all reality. Relict karst14 is also a misleading term since it is based on the undefined concept of ‘survival’. What is it that survives of ‘karst landforms that were created at the Earth’s surface under one set of morphogenic conditions?’ Morphologies only? As we have already seen in the above examples, the presumed paleokarst can maintain its hydrogeological functions, so how can one truly separate old morphologies from more recent ones? In most cases, hydrographic and geomorphic selection criteria are used, all based on how the researcher believes the hydrogeologic setting was functioning in the past. Ford and Williams2 draw attention to this problem but leave the issue open, by introducing the category of true paleokarst or buried karst. These authors also use the term fossilized for this category—obviously intending to link the category with the concept of ‘extinct’. However, while an extinct, buried creature is literally ‘de-coupled’ from the present biosphere, no lithostructure, let alone a buried landform (which represents an important anisotropy inside a lithostructure), can be truly de-coupled from the present hydrogeochemical system, be it surficial or deep. Finally, it is impossible to distinguish between an exhumed karst when ‘stripped of its cover beds’ (as defined by all authors) and a relict karst. Again, it is entirely at the researcher’s discretion (which depends on his pre-conceived view of the whole system) to decide which landform is what, no matter which of the above-mentioned definitions is used. In my view, it is not possible to interpret true paleokarst on the basis of its landform (or as a geographic feature). It is a lithostructural (or geologic) feature, hence it must have undergone at least one geologic event—i.e. a chemical, physical and/or tectonic change due to geological processes.23 And the so-called true paleokarst can occur in a wide array of settings, ranging from voids (acting as secondary porosity), to intrastratal breccias, and to complex petrographic structures (including some ore deposits). Any other karst or fossil karst feature that is still a landform, i.e. is exposed to surface processes, no matter its actual age or geomorphic setting, is just a karst feature which may be assigned to a stage of the history of a given karst geosystem. 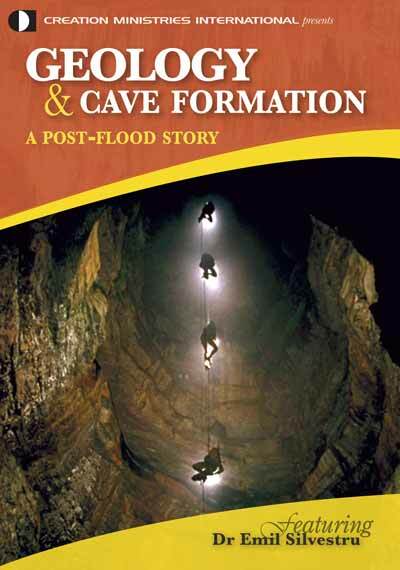 The use of the term fossil karst is essential in such a case, because it implies that diagenesis* had not affected the karst geosystem. In the case of true paleokarst, diagenesis does not normally wipe away the difference essential to karstification between soluble and insoluble (or rather, highly soluble and less soluble) rocks. On the other hand, it seems most unlikely that paleokarst can be buried beyond the reach of infiltrated water given the surprising results concerning running water in the ultra-deep drilling in Kola as well as a wide range of deep mines I have visited; that is, before the whole sedimentary sequence reaches metamorphism depth and therefore loses its original structure. Once water reaches the soluble/insoluble rock boundary, as would happen in the absolute majority of cases, it will exploit it, by corroding the soluble rock and thus generating karst features. Even if it may be argued that at some depth water is saturated and therefore non-corrosive (in which case it would be expected to precipitate its excess of calcium carbonate as identifiable lithologic features), the external erosion and uplift would eventually bring the paleokarst to ‘corrosive water depth’. By the time erosion and uplift brings the paleokarst to surface again, clear neokarst* features should be superimposed on the original paleokarst. The literature I have managed to investigate thus far makes no clear reference to such features in paleokarst. 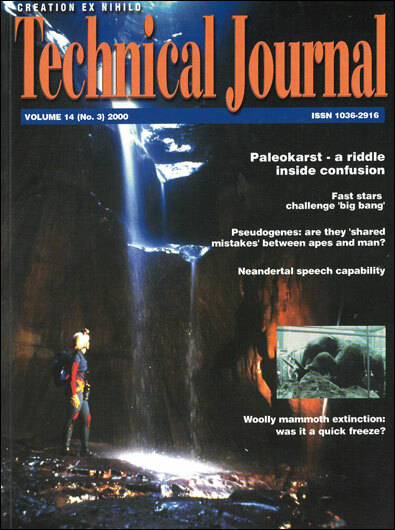 Geologists consider paleokarst as a geomorphic feature indicating continental conditions. Yet, in those cases where geomorphic conditions in the past were ideal for karst features to form but no such features are found, the issue is ignored altogether. Here is one example: in the Swiss Alps, (north of Lake Thun) the Schrattenkalk limestone, which is considered of Cretaceous age (Barremian-Aptian in Urgonian facies), is overlain by the Late Eocene Hohgant sandstone.24 I followed the Cretaceous/Eocene paraconformity (that covers, according to standard geology, roughly 75 Ma) and was surprised not to find the slightest sign of any paleorelief, let alone paleokarst, along the paraconformity. Yet, a cave has now developed exactly along it. Neither geologists nor karstologists seem at all bothered about this very unusual setting! However, in this part of Europe (in fact in most of Europe) there were, according to standard geology, at least 4 Ma of continental conditions (in the Early Paleocene or Danian) during the above-mentioned interval, and karst should have formed. In my view, one must first look for recurrent paleokarst episodes and/or evidence of their true aerial development. Local, small-scale, karst-like features, and even occasionally medium scale isolated features on one surface in a sedimentary sequence, are not reliable proof of karstification under a sub-aerial environment. We shall therefore concentrate on recurrent episodes, rather than details. At this point, it seems to me that a discussion of the general pattern of worldwide karst occurrence is more useful for testing the evolutionist framework of paleokarst. There are two basic types of paleokarst: classical (exogenous, originating at or near the earth’s surface) and hydrothermal (endogenous, originating below the earth’s surface). The latter is much more complex as it involves a great deal of ‘complementary geology’, i.e. the history of hydrothermal solutions, geochemistry, tectonics, mineralogy, etc. besides karstology proper. Furthermore, this type can develop completely de-coupled from external conditions at the surface. Hence, we shall deal only with classical paleokarst. Hydrothermal paleokarst is a separate topic that deserves a separate paper. When looking for paleokarst, one immediately thinks of cratons because they have the longest continental history. Sure enough, ancient features have been identified on cratons by geologists and engineers, usually in man-made sections either in mines or road works. However, it is important to understand that at no location is an extended paleokarst surface displayed. All descriptions of such surfaces have been extrapolated from boreholes, and consequently they reflect pre-existent theoretical models. Far from claiming to be exhaustive, the following examples are considered by most specialists as possible or even certain paleokarst. I have presented the data within the framework of the uniformitarian geological column, only because that is how the data has been already interpreted. Naturally, as I make clear later in this paper, I do not endorse the million-year time-scale. The Archean does not display any known paleokarst features. The first extensive paleokarst is of sub-continental extent from the Ordovician, in North America. The cyclic platform karst, ‘the Post-Sauk Karst’, is the most common karst feature for this period. The Devonian-Carboniferous boundary is probably the greatest global period of karstification. The Permian shifted the case to Europe, Russia, China and generated local paleokarst in Canada. At the end of the Jurassic and the beginning of the Cretaceous, many limestone deposits in Europe seem to have emerged and karstified in a low-relief, low-energy environment. This paleokarst is associated with bauxite deposits accumulated in what is believed to be lacustrine (lake) conditions inside dolines and uvalas. 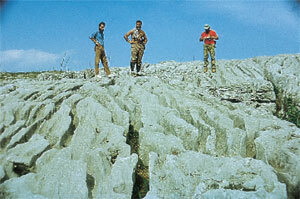 The type locality is Le Baux, France (where the name ‘bauxite’ comes from). Hungary and Romania also share such features and ore deposits. In broad terms, the Proterozoic to Devonian interval generated what seems to be paleokarsts mainly on the North American continent. The Devonian-Carboniferous period was more or less global, and beginning with the Permian, the weight of paleokarstification moved to Eurasia. There are a number of important questions that emerge from this pattern of karstification, presented as it is within the usual uniformitarian framework of biological evolution, plate tectonics and continental drift over millions of years. The continental masses were more or less grouped from the Precambrian until the Permian. Limestones were relatively uniformly distributed, yet paleokarst features concentrate mostly in the future North America. According to accepted reconstructions, the North American continent was located between the Equator and either 30°N or 30°S, while Eurasia was further to the south in temperate climate.25 In such a location, the climate, especially in the case of the Late Proterozoic and Cambrian, can hardly account for the North American predominance of karst features, since karstification is known to be active from equatorial to subpolar regions. Nor can relief energy, since it was the same, i.e. reduced, worldwide. If the culprit is atmospheric chemistry, are we to believe that the primeval atmosphere was highly inhomogeneous? Or was it rather local lithological difference? In what way? Let us not forget that, though alteration soils already existed, there were supposedly no organically-rich soils to boost the CO2 content in the water reaching the limestone. As for the CO2 content of the atmosphere, one can only guess since no reliable data is available. So, was it karst anyway? Were surface karstification processes possible at all during the Proterozoic and early Cambrian? Why should we associate any negative paleorelief feature (such as holes, shafts, and valleys) to karstification processes just because they are found on rocks that are more soluble? Even more so, since no indication has ever been found for the existence of the four essential karst hydrographic zones at the same paleokarst location. Research (using evolutionary frameworks) revealed that compared to recent values, during the early Paleozoic the partial pressure of CO2 (PCO2) might have been about 10 times higher than today’s, and 4–6 times higher during the middle Mesozoic.26 So, why does paleokarst occur on some limestone terrains and not on others, when the climate was more or less ideal and PCO2 was so high that the rainwater would have been aggressively corrosive? Lithology again? How—since today there is little difference between the limestones of Proterozoic age of North America and Europe? Goethites (iron hydroxides resulting from the alteration of iron minerals under continental conditions) in the Neda Formation in Wisconsin revealed that in the Upper Ordovician the PCO2 was some 16 times higher than today.26 Well, that makes that period a prime time for karstification. Yet, the alleged paleokarsts described in North America for the entire Ordovician are rather poor—at most, karst only reached the proto-karstification stage.27 This is strange: there were limestones and dolomites up to 1,200 m thick and exposed to karstification in a very CO2-rich atmosphere for alleged millions of years. Yet only a few metres to 140 metres of the surface was removed!28 The arid to semi-arid climate is no excuse for the absence of any significant karstification over such a long period of time. The ratio of denudation (ROD) on limestones in the Sahara has been determined at 6 mm/ka under present conditions.29 Given the previously mentioned PCO2 values calculated for the Ordovician,27 one may parsimoniously consider a ROD of 100 mm/ka for that period. What happened then? Why was there such a poor rate of denudation? Or maybe those alleged millions of years of karstification did not exist! Let us now look at the paleokarsts of the Devonian/Carboniferous which were almost global. According to standard geology, the continents were much closer to each other than today; there was an important vegetal biomass; climate was relatively homogenous and quite stable; and humidity was high. PCO2 was probably much higher than today, and we are told there were at least 20 Ma of full-throttle karstification. Considering an average of 50 mm/ka ROD—based on present day conditions30—for comparable climate conditions but a higher PCO2 , one may again estimate about 100 mm/ka for the Devonian/Carboniferous ROD. That means that at least 2,000 m should have corroded away in the 20-Ma uniformitarian time available! Nothing like that is reported from the geological archives. The highest estimates so far for the amount of carbonates removed by karstification are only 200 m.
One may of course argue that the low-energy relief of the landscape never exposed the entire carbonate pile. In that case, an intricate and deep water table and phreatic type of karst2 is expected (as all theoretical models and present examples actually require in such a setting), with extensive mazes of winding conduits that can better survive geologic events and which display unmistakable paleokarst features. Yet, there is nothing like that in the archives. As a matter-of-fact, this kind of paleokarst should occur before each marine transgression, because the water table would rise with the rise in sea level (or the subsidence of the continents). Unless of course, the transgressions were very rapid—which is not the case presented by evolutionary geology. Finally, the question both geologists and karstologists seem reluctant to ask, ‘Why was there so little, if any, aerial paleokarst during the Tertiary?’ There are karstoplains (a term based on Davis’ concept of peneplain,1,34,35 also known as ‘corrosional plains’2 ) today, so why was karst so highly localised? Why did no true, extensive paleokarst surfaces form, and why weren’t they covered by sediment and preserved? The conditions for karstification during the Eocene, Oligocene, Miocene and Pliocene were warmer, and wetter—in one word, ideal. Most karstologists and geomorphologists tend to believe that the karstoplains of today are remnants of the Early Tertiary ones, broken up by tectonics and sometimes by erosional (non-karstic) surfaces and continuously karstified until present times. In other words, 65 Ma of a different geomorphology (as compared to the pre-Tertiary one). Why then is there any limestone left? If one uses a very low ROD, 50 mm/ka, as an average for the entire Tertiary, the total removal by solution during the Tertiary should have been roughly 3,000 m. In addition to this, one must not forget that the Quaternary has contributed a great deal of mechanical and chemical erosion to whatever was left of the Tertiary relief. Furthermore, in Romania for example, in the Villafranchian (Late Pliocene-Middle Pleistocene) the Wallachian tectonism uplifted most of the relief, in some places up to 1,000 m.36 For the karst geosystem, this means a dramatic increase in the karstification processes and implicitly a higher ROD. This is another reason why we should question why there is still so much limestone left. From the Proterozoic to Mesozoic, all paleokarst features seem to have been reduced to local minor surface features. During the Mesozoic, it is claimed that major karst features formed only in some parts of Europe (namely Yugoslavia). The other regions of the earth, even when karstification conditions were much better than today, seem to have produced nothing but bauxite ore deposits in minor surface karst features. Similarly, the Tertiary produced little, if any, aerial paleokarst, even though karstification conditions were supposedly good enough and long enough to generate a complex and widely developed surface and subsurface karst. The Quaternary, the shortest era according to evolutionary geology, has managed to make up for it all. In this ‘short’ period, karstification processes have been able to generate the grandiose karst features we see all over the world today, from the equatorial to polar regions. It is clear that there must have been a major qualitative change in the genesis of landforms, especially karst landforms, at the end of the Tertiary. A logical inference from this change is that true karstification processes, like the ones we are witnessing today (which after all are the ones that inspired the very idea of karstification), only occurred in the Quaternary. All previous karst-like features represent protokarst (incipient or incomplete karst) or pseudokarst. In my view, the pattern of karst landscapes is an excellent reflection of the qualitatively different processes operating during the different stages of the worldwide Flood, and during the 4,300-year post-Flood era. Karst literature abounds with terms formed by combining prefixes like pseudo, vulcano, halo (referring to halides), and thermo (referring to karst features generated by warm or hot air in ice) with the root karst. Unfortunately this terminology brings together features that are genetically very different, and leads to confusion and misunderstanding. How can one consider, for example, the morphological similarities between a cave formed from ice melted by warm air, and a cave formed in limestone by the complicated processes of chemical erosion and litho-structural control? To clarify the situation, I have used a simplified terminology in this paper, to ensure consistency of terminology, utilising as few criteria as possible. b) parakarst: karst features generated on karst rocks other than limestone, mainly by chemical erosion. Pneumatolysis: the alteration of rock or crystallization of minerals by gaseous emanations from the late stages of a solidifying magma. Small scale features: (also known as clints and grikes or lapiés), kamenitzas. Medium scale features: dolines (sinkholes or shakeholes), uvalas, shafts, ponors (swallowholes or swallets), karst springs. Large scale features: pocket valleys, blind valleys, and poljes. Bleahu, M.D., Morfologia carstica, Editura Stiintifica, Bucharest, Romania, 1974. Return to Text. Ford, D.C. and Williams, P.W., Karst Geomorphology and Hydrology, Chapman & Hall, London, 1992. Return to Text. Cvijić, J., Das Karstphaenomen: Versuch einer morphologischen Monographie,. Geographishe Abhandlung 5(3):218–329, 1893. Return to Text. Racovitza, E.G., Essai sur les problèmes biospélélogiques, Biospeologica I, 1907. Return to Text. Constantinescu, T., Considérations sur la zone karstique de ‘La Movile’ (Mangalia, Dobrogea de Sud) Roumanie), Miscellanea Speologica Romanica 1:7–12, 1989. See also Wieland, C., ‘Lost world of mutants’ discovered, Journal of Creation 10(2):172–173, 1996. Return to Text. Sârbu, S. and Popa, R., A unique chemoautotropically based cave ecosystem; in: Camacho, A. (ed. ), The Natural History of Biospeleology, Madrid, Spain, pp. 637–666, 1992. Return to Text. Lascu, C., Popa, R., Sârbu, S., Vlasceanu, L. and Prodan, S., La grotte de Movile: une faune hors du temps, La Recherche 24:1091–1098, 1993. Return to Text. Jennings, J.M., Karst Geomorphology, Basil Blackwell Ltd., London, 1985. Return to Text. Sweeting, M.M., Karst Landforms, Columbia University Press, New York, NY, 1973. Return to Text. Ford, T.D. and Cullingford, C.H.D., The Science of Speleology, Academic Press, 1976. Return to Text. Jennings, J.M., Karst, The M.I.T. Press, Cambridge, MA, 1973. Return to Text. Moore, G.W., Speleothem—a new cave term, N.S.S. News 10(6), p. 2, 1952. Return to Text. Francke, H.W.K., Munnich, K.O. and Vogel, J.C., Auflösung und Abschiedung von Kalk –14 C Datierung von Kalkabscheidungen, Die Höhle 9:1–5, 1958. Return to Text. Bosák, P. (ed. ), Ford, D.C., Glazek, J. and Horacek, I. (co-eds), Paleokarst—a systematic and regional view, Academia Prague, Czechoslovakia, 1989. Return to Text. Martonne, E., Traité de Géographie Physique II, Paris, France, 1910. Return to Text. Silvestru, E., Stratigrafia si sedimentologia depozitelor clastice din exo si endocarstul zonei Padis-Cetatile Ponorului, Ph.D. thesis, Universitatea ‘Babes-Bolyai’, Cluj Napoca, Romania, 1997. Return to Text. Silvestru, E., Aspects of karstification in the crystalline limestones on the southern slope of Rodnei Mountains, Theoretical and Applied Karstology 2:87–95, 1985. Return to Text. Mârza, I. and Silvestru, E., First mention of the hydrothermal karst phenomenon associated to Neogene metasomatic sulphide ore deposits from Rodna Veche, Studia Universitatis ‘Babes-Bolyai’, Geologica-Geographica XXXIII:77–81, 1988. Return to Text. Mansouri, A., Gissements de Pb-Zn et karstification en milieu continental: le district du Djebel Hallouf-Sidi Bou Aouane (Tunisie septentrionale), Thèse 3e cycle, Paris, France, VI, Géol. Appl., 1980. Return to Text. Verraes, G., Contribution à l’étude de la province métallogénique sous-cévenole. Les gîthes Pb-Zn de Montdardier, la Sanguinède et 102, district des Malines (Gard), France, Thèse Doct., Univ. USTL, Montpellier, CERGH, 1979. Return to Text. Bakalowicz, M., Un modèle de karst hydrothermal: le karst des Black Hills, Sud Dakota, sur l’exemple des grottes de Wind et de Jewel, Table Ronde Franco-Polonaise, Sosnowiec (Pologne), pp. 7–8, 1987. Return to Text. Bakalowicz, M., La mine Pomorzany à Olkusz. Réflexions sur les paléokarsts à sulfures, Table Ronde Franco-Polonaise, Sosnowiec (Pologne), p. 25, 1987. Return to Text. Silvestru, E. and Ghergari, L., On the Paleokarst in the cave Ghetarul de la Scarisoara (Bihor Mountains, Romania), Theoretical and Applied Karstology 7:155–161, 1994. Return to Text. Jeannin, P-Y., La région karstique du Nord du lac de Thoune (Suisse), Actes du 9e Congrés national de spéléologie, Charmey, pp. 123–126, 1991. Return to Text. Donovan, K.S., The fit of the continents in the late Precambrian, Nature 327:139–141, 1987. Return to Text. Yapp J.C. and Poths, H., Ancient atmospheric CO2 pressure inferred from natural goethites, Nature 355:342–343, 1992. Return to Text. James, N.P. and Choquette, P.W. (eds), Paleokarst, Springer-Verlag, New York, NY, 1988. Return to Text. Desrochers, A. and James, N.P., Paleozoic surface and subsurface paleokarst: Middle Ordovician carbonates, Mingan Islands, Quebec, 1988; in: James, N.P. and Choquette, P.W. (eds), Paleokarst, Springer-Verlag, New York, NY, pp. 183–210, 1988. Return to Text. Corbel, J., Erosion en terrain calcaire (Vitesse d’érosion et morphologie), Ann. Géogr. LXVIII:(366), 97–120, 1959. Return to Text. Benton, M.J., Cook, E., Grigorescu, D., Popa, E. and Tállodi, E., Dinosaurs and other tetrapods in the Early Cretaceous bauxite-filled fissure, northwestern Romania, Palaeogeography, Palaeoclimatology, Palaeoecology 130:275–292, 1997. Return to Text. Oard, M.J., What can 10,000 dinosaur bones in a bauxite lens tell us? Journal of Creation 13(1):8–9, 1999. Return to Text. Ianovici, V., Borcos, M., Bleahu, M., Patrulius, D., Lupu, M., Dimitrescu, R. and Savu, H., Geologia Muntilor Apuseni, Ed. Acad. R.S.R., Bucuresti, p. 631, 1976. Return to Text. Silvestru, E., Mátyási, S. and Bucur, I.I., Proposal for a series of formal lithostratigraphic units from the Lower Triassic to the Upper Jurassic in the Central Bihor Mountains (Apuseni Mountains, Romania), Studia Universitatis ‘Babes-Bolyai’, Geologia XLI(2):131–136., Cluj Napoca, Romania, 1996. Return to Text. Davis, W.M., The geographical cycle, Geog. Jour. 14:481–504, 1899. Return to Text. Choppy, J., Dictionaire de spéléologie physique et karstologie, Speleoclub de Paris, 1985. Return to Text. Mutihac, V., Ionesi, L., Geologia Romaniei., Ed. Tehnica, Bucuresti, p. 646, 1974. Return to Text. Silvestru, E., Propositions pour une classification litho-génétique des formes karstiques et apparentées, Karstologia 15:55–57, 1990. Return to Text.